These guys have been a long-time client of ours, our first in fact, so when it came to doing a redesign of their website we bent over backwards to incorporate all their requirements. 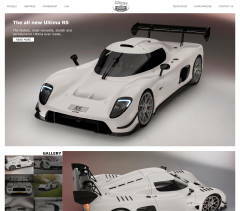 This included several iterations of the responsive look and feel to suit desktop, tablet, and mobile screens and a lot of trial images on trial web pages until they were satisfied with the look. We produced an extensive gallery, embedded video clips, and a flexible layout to take in future pages. Although they have their own hosting we completely manage that for them including raising faults with their ISP. We also manage the site content for them as it is more efficient for them to e-mail through any additions and changes and let us incorporate them into the site - which is very easy for us to do because of our very flexible content templates. This site was developed for the Club partly as a way to attract new members (they can pay for their membership online using PayPal and SagePay), partly as a way to publicise the Club and what it can offer, and partly as a way for existing members and Triumph fans to come together. It was designed with mobiles firmly in mind. We are currently integrating in a message board which will be open to non-members, and a forum which will be members-only. 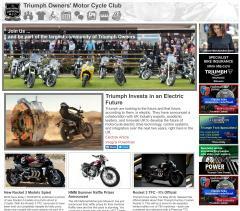 Part of the site has content which can be edited directly by members, this allowing them to do write-ups of their best loved Triumph models. A feature of the site is the ability for each of the indivdual branches around the country to be able to change their own details on the site, and add their own events. The public can also add their own events and links, which are moderated by Club officials before going live on the site. The Biker Meets team wanted a modern site that was easily searchable and which used location services to find meeting places within a radius of a location. We were happy to oblidge and produced a comprehensive site that allows anyone to add a new venue - subject to it being approved by administrators. We integrated Bing maps into the site to give it a quick and easy reference for the various meeting place locations, and to also allow the exact spot of the meeting place to be set when adding or editing venues. Key to the publicity for the site was integration with Twitter and Facebook - the site tweets the added and edited venues as they are approved and the Twitter integration with Facebook ensures the messages are replicated there also. 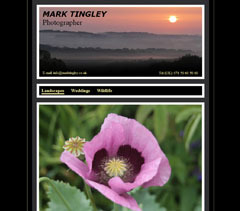 We were contacted by Mark Tingley to set up a simple showcase site for his fledgling photography business. The only brief was to produce a simple gallery based site where the photos changed every few seconds in rotation. Access to the raw photos needed to be protected so that they could be sold through the site in future but initially it would be a simple showcase. We produced a design within a week, using our hosting framework, and after a minor tweak the site went live. We have since updated it with more photos and will continue to make changes to the content ourselves under instruction from the client. We also set up e-mail addresses to forward to the client's own e-mail addresses. This is a great example of a cheap and effective website which can improve the visibility and accessibility of your business on the web. When these guys needed a re-design for their old website, we were happy to oblige. We got an initial brief from the client with which we developed a prototype - which the client loved. After a few changes and tweaks we arrived at a design which brought together the client's needs with good clean design. The client's work is very confidential so we couldn't source any images from their clients or workplace, so we spent some time searching through readily available stock images for the right ones to illustrate the pages. Development was very quick using our hosting framework with all relevant data being stored in simple XML files which can easily be edited using our dedicated Content Management System. To host the site we liaised with the domain registrar to get the nameservers changed and set up the hosting on our own servers.